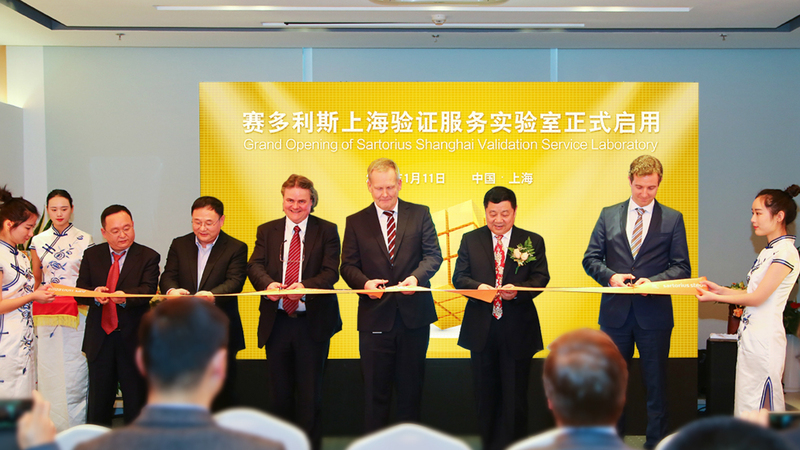 Sartorius Stedim Biotech (SSB), a leading international supplier for the biopharmaceutical industry, opened a new validation service laboratory yesterday at its site in Shanghai Zhangjiang Hi-Tech Park. The opening event was attended by business partners from the biopharmaceutical industry and representatives of the local community. With its new laboratory, Sartorius Stedim Biotech is making validation of membrane filters even more convenient and time-saving. Chinese customers can have their entire process steps validated locally and will also benefit from direct interaction with Sartorius specialists on site. “Our Shanghai validation lab provides high-quality services that are fully compliant with applicable GMP and GLP principles. At this validation service lab, we now offer comprehensive process validation studies for the strongly growing Chinese pharma market,” stated Dr. Jörg Lindenblatt, SSB’s Senior Vice President of Sales for Bioprocess Solutions in Asia, in his opening speech. The validation lab, together with SSB’s Application Center in Shanghai, provides a full range of extended services to the biopharmaceutical industry.